There's a fast food ad campaign which includes the tagline, "We have the meats." Sorry, drive-through, but you can't hold a toothpick to Brazilian steakhouse Fogo de Chão. They, indeed, have the meats. I was invited to sample their fall menu at the Los Angeles location. The Fogo de Chão way is to keep bringing grilled, table-sliced meat to your table until you tell them to stop. One has to be careful with this style of service, because it’s easy to end up feeling like Earl, in "Diner." He ate the whole left side of the menu. Including the chicken dinner. Cruz was our server, or one of many servers, and he promised we would leave feeling sated. General Manager Heather was more helpful than we could have hoped and customer service manager Moises was a true gentleman. 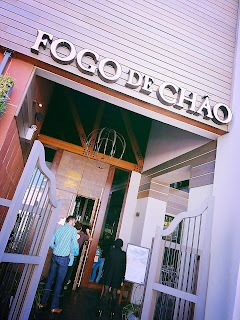 Fogo de Chão is a great place for groups. There were several large parties there on the Sunday when we went for lunch. I could tell that they were not strangers to the place, and that the entire group had been looking forward to the meal. I opened the meal with a Brazilian Moscato/Malvasia/Gewurztraminer blend, the demi-sec Salton "Flowers." It’s an $11 glass, from the Serra Gaúcha region, in southern Brazil. The wine is very sweet and fruity, with a decent acidity. A spicy floral element comes from the Gewurztraminer, while the Malvasia offers up some citrus to the sweet moscato. It’s extremely tasty with mushrooms and salads. I ordered an Alamos Argentine Malbec when the meats became the focus, and it was predictable reliable. The wine list offers a wide choice, with plenty of South American options. They have a beautiful, light potato salad at Fogo de Chão that doesn't take up too much of the appetite you want to reserve for the meat. Big chunks of potato and carrot are bathed in a wonderfully light dressing. The butternut squash soup is different. It's very nicely spiced and better than the usual I've had, possibly because of the coconut milk and cinnamon used in it. The mashed potatoes have a good consistency, and they're real, not fake. My wife says they are complemented by "just the right amount of butter - too much." Here come the meats. A little girl near our table precociously asked my wife, "Do you know what I call this restaurant?" Without hesitation, she said, "The meat parade." And so it is. The Linguiça sausage was excellent, smoked in sage and rosemary. The Cordeiro leg of lamb, grilled and earthy, was right where I live. The Beef Ancho, the prime part of the rib eye, is succulent and extremely flavorful. The bone-in Cowboy Ribeye is only available through January 1st, so don't wait. Bone-in meats, says Fogo de Chão, have a more decadent flavor because the bones help retain moisture during the slow cooking. I didn't try the Picanha Burger, But I wish I had. It sounds so good: "Fresh picanha (sirloin cap) ground in-house sits atop a brioche bun with smoked provolone, bibb lettuce, tomato, onion and chimichurri aioli, served with crispy polenta fries." Our meal was in the main dining room, but there’s an option for folks who want to eat or spend less. 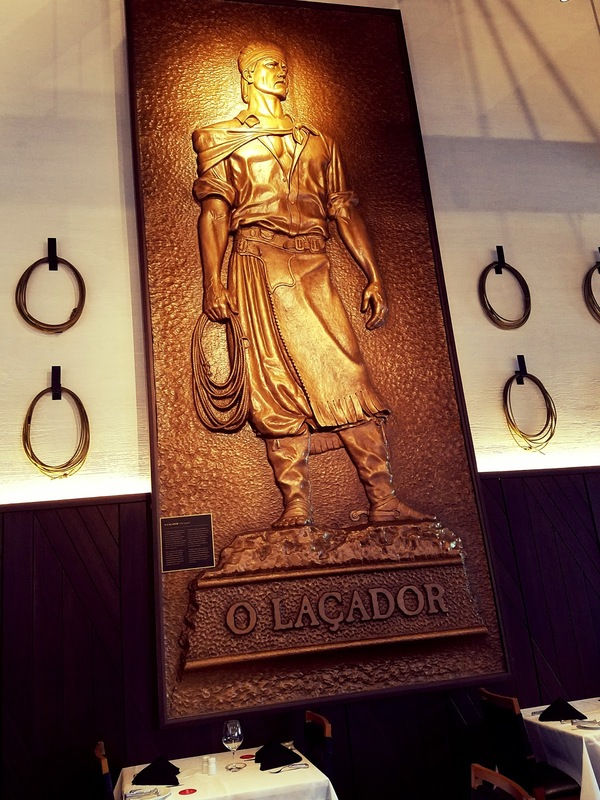 The Churrasco Meat Board happens in the more casual Bar Fogo setting, where you get one, two or three selections of fire-roasted meat, including beef or pork ribs, lamb chops and beer-braised chicken legs, served with their wonderful chimichurri sauce. But, when is chimichurri sauce not wonderful? 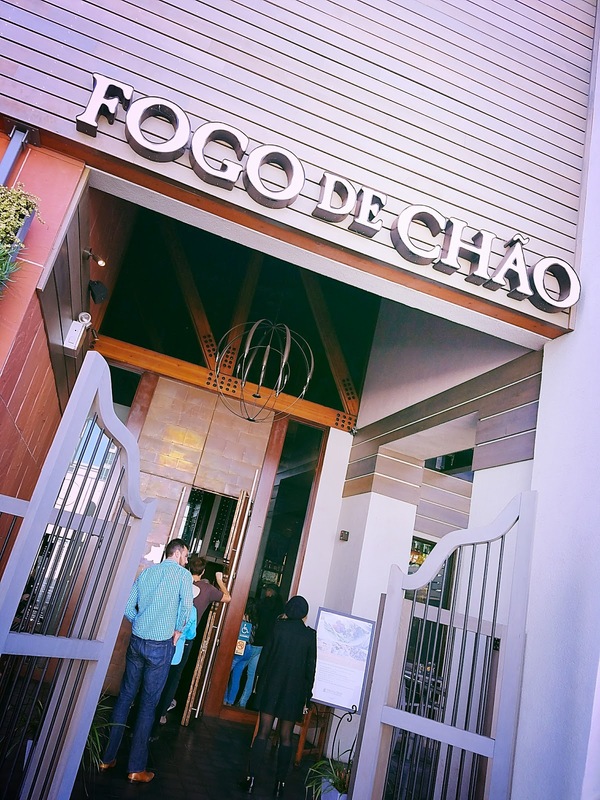 I was completely wowed by my dining experience and gave Fogo de Chão an A-. The flavor is uniformly fantastic, but I found some of the beef items a little tough. My wife gave the experience a solid B, as she is always more focused on beef than I am and more critical of its consistency. She agreed that the flavor couldn't be beat and she was in love with the sides.